In between nursing sick kiddos (they are both on the mend now), work, and all of the special events that happen this time of year, I've still managed to get some Christmas crafting done. I made this paper medallion for my daughter's music teacher this morning, while Shannon was getting ready for school. I think these will be my go-to gift this year for all those special people I want to give a little something to along with their Christmas cards. Some will be Christmas-themed, and some (like this one) will be geared to the recipients' interests. 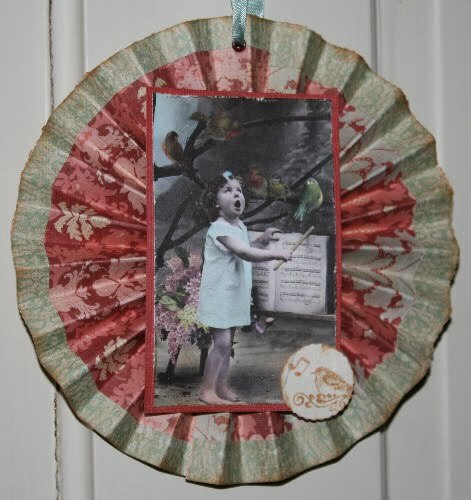 For instructions on how to make these medallions, check out Lisa Zappa's fabulous blog, here. Hope you're able to slow down a little today and appreciate the season! This is just beautiful, Marcy! What a great idea to make these for your loved ones! I hope the kids feel better quickly and that their mamma stays healthy and happy! Wishing you a wonderful Christmas time, my friend!